Recessed Tile Boxes with patterns. Proven efficiency as a research tool in study by therapists at Boston University correlating ACLS scores with functional outcomes. 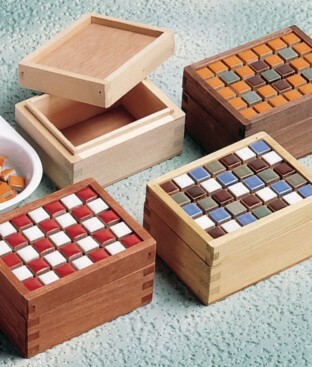 Includes 6 wood boxes with recessed lids, 6 colors of tile (packaged individually) and sandpaper. Order stain, stain and paint cups, brushes and bins separately. 3-3/4"W x 2-3/4"H x 1-3/4"D. per pack. Level 3.0-4.8.